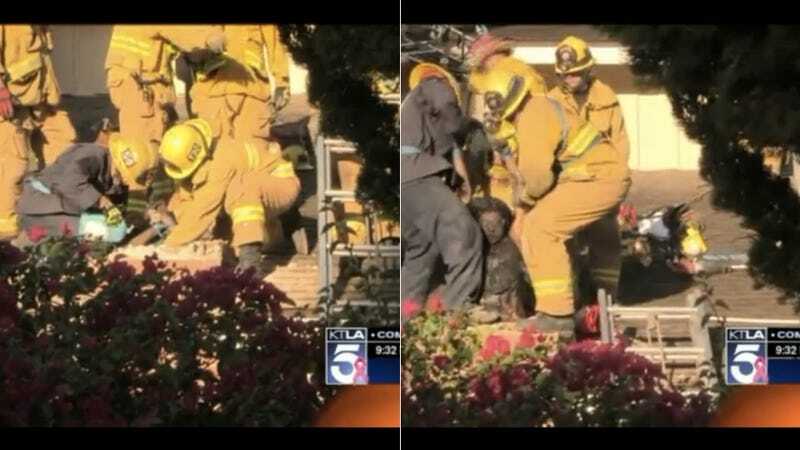 A woman got stuck in a chimney this weekend while trying to break into the home of a guy she'd been seeing. Fireplaces are better than front doors, as we all know. "She seemed totally cool—until the first flag was her actually being on my roof two weeks ago," The Dude Who Owns the Chimney But Did Not Want to be Named told KTLA News. On Sunday, Genoveva Nunez-Figueroa was arrested for "allegedly illegally entering a residence and providing false information to a peace officer." She was rescued from the flue after neighbors called authorities to say she'd been stuck in there for about two hours. The Dude Who Owns the Chimney But Did Not Want to be Named was not home at the time. Firemen pulled the chimney apart, brick by brick, then slicked the remaining flue with liquid soap to extricate Nunez-Figueroa. She he was then taken to a nearby hospital, her pride likely missing a few bricks.